Says Monk Tomás Ramon (Notes on Alcañiz, manuscript of the 17th century): " the first population increased and grew up towards the street that we call of the Clergymen, today Holy Pau, in his two sidewalks, with that it is of Nobility as leaves to Val's turret, and as the wall continues up to the portal of San Antonio (today Mendizábals square). This population is walled and develops concerning two sensitively perpendicular axes: Majors street  Alejandres street,t heatre - Raise of the Commissions street. In the sector understood between her the there constructs the collegiate church of Santa Marias the major church herself , which will turn, from then, into the first church alcañizana. Outside of the city, in the suburb, there is consolidated concerning the neighborhood of the Pueyo a marginal constituted population, principally, by Jews. Also small Moorish accessions appear under of Santa Marias summit. The works of construction of the collegiate church and of his splendid Gothic tower, which still is kept. Were concluded in the 14th century the tower of the Honoring of the Castle is constructed which interior walls are decorated by beautiful paintings that still we can contemplate. Close to the bridge, the Dominicans build the Alcañiz's first convent to another side in the river. The succession of the successor crisis, created after the death of Martin I with the restoration of the Castilian dynasty of the house of Antequera, and the definitive overcoming of the Moslem problem, they prepare the environment adapted for an economic development of extraordinary urban development importance of the city. The military thing yields to the impulse of the civil thing. The most important building that is constructed in Alcañiz in this century is that of the Strap, symbol proud of the new one citizen feels. During the first third of the century the population experiences a growth of 25 %, whose accession demands the accomplishment of a new widening in the north zone, occupying the existing space between to the ciudad and the river, planning his streets in reticle, without other one worry that her of obtaining better living conditions for his neighbors. This way there are born, in the only enclosure, two neighborhoods separated by the Major street: Almudines and Santiago. 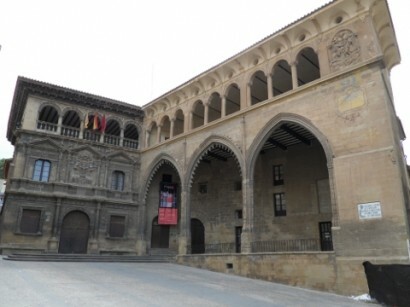 The urban resultant space will be sufficient to satisfy Alcañiz's needs until this century.